My wife bought some large fish from the market and put them in one of our many large guppy tanks. A few days later, while feeding the guppies, I noticed one of the new fish floating at the surface, its mouth clearly out of the water. I told my wife one of her fish had died.......but she tapped it on the head and it went back under the water. I'd never seen a fish do such a thing.......and pronounced the fish the 'submarine fish'. My wife called it ปลาปู่. ปลาปู่ make delicious tomyam.....but, for now, the ones my wife bought are getting a reprieve....and getting fatter....inside our guppy tank. If you like reading Thai fairy tales.......ปลาปู่ทอง is an old-time favorite....in books and in movies. We catch the ปลาปู่ (bpla bpu) in local waters fairly often. 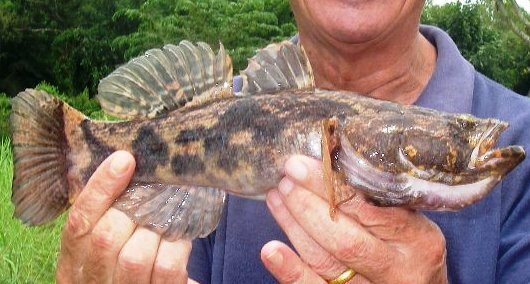 The English name is Marble Goby. Due to the Thai folk tale about the ปลาปู่ทอง (bpla pbu tong) or Golden Goby, some Thais won't eat this fish even though it is quite tasty. It is an interesting fish to catch as often you will feel or see a very slight bite and then nothing. You will think the fish is gone but when you start to reel in it will be on the hook. The coloring varies widely and once hooked it is brought in easily with hardly any resistance. There's something amiss with the dates. If you're trying to motivate yourself to learn to read Thai....if you can break that beginner barrier......where you can put just a few words together......words that you'll see everyday everywhere....ไก่ รถ อุดร หมู or just start out on license plates where you can practice your knowledge of the alphabet........if you can break that barrier and keep at it, you'll soon find your ability to spot more words you know........begin to read signs.........begin to understand a menu......and all that helps reinforce your reading skills. Today, while in the AIS shop in Central......watching the girls ogle the latest iphones.......I noticed this sign which is broken into bite-size pieces. Thais use สุด a lot! I think I know the difference between phak and yuu. I welcome some elucidation. Why do so many Thais, even those who have known me to live here (permanently) for more than a decade, use the former rather than the latter? At every police stop (and there have been hundreds) the cops always ask where I phak. Wouldnt they have to subtract one date from the other to work out its for 5 years . Come on Giggle , your slipping , i mean they are police not rocket scientists !!!!! Our (current) favorite evening eat spot is opposite the main Bangkok Bank office, on the corner opposite Luck Photo Studio and next to the 407 Bus Line. The name is ผักบุ้งเหิรฟ้า......been at this location for 6 or 7 years. It's a nighttime place.....opens at 6PM until the wee hours to satisfy all the club crowds. You don't go there for the ambiance......but the food is tops without the parsley and floral decorations and fancy prices. The restaurant is reason #3391-5 for learning to read Thai.....the menu is in Thai only. Our favorite dishes are the signature ผักบุ้งไฟแกง ถั่วงอกผัดหมูกรอบ and หอยลาย. The หอยลาย is packed with kaffir leaves, finger root Chinese ginger, chili, and other spices that pack a punch. Quick service, haven't had a dish that wasn't good and we've tried many. Any takers on the sign? Order to start a new que? Start at the clock circle, pass the Bangkok Bank on your left. Just before you come to the first traffic light, the restaurant is on your right. Here's my take........you and your friends go into this empty restaurant, order food, and get your food before others who arrive after you. But then. ......as the restaurant becomes packed, you realize you need one or five more plates of ผัดกระเพรา........and, after seeing the other customers get their food before your new order arrives, you take it out on the waitress. She pointed to to the signs.... ..posted everywhere. People who make new orders (สั่งต่อ) go to the back of the queue.